The rates featured below are basic hourly rates to give you a basis to start with. Our yacht charter coordinators and captains are very flexible and can customize a package for your event or occasion based on your needs. Additional accommodations can be made for catering, cocktails, and entertainment. Boarding of the High Spirits can be at the Harbor Drive Hornblower terminal or at another location of your choice (additional docking fees may apply for remote locations). 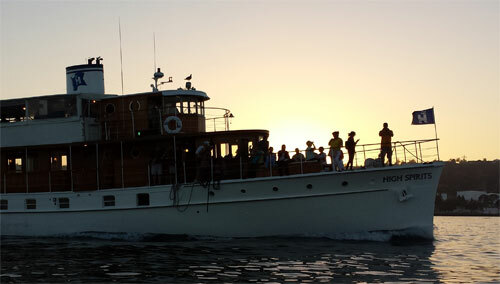 Typical San Diego Harbor cruises entail a relaxing bay tour featuring photographic points of interest such as the San Diego Skyline, Point Loma, Sea Lion viewing, Seaport Village, the USS Midway, Star of India, and the Coronado Bay Bridge. 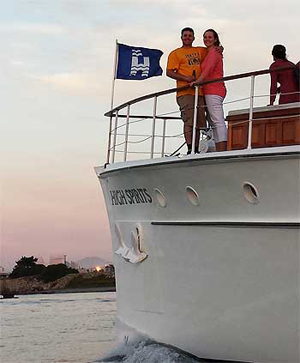 High Spirits is a beautifully restored classic motor yacht built in 1929 in the Mathis Shipyard in Camden, New Jersey designed by world famous boatwright, John Trumpy. Many experts consider him to be the best designer of his time. Most of Trumpy’s works of art are considered treasured collector items. 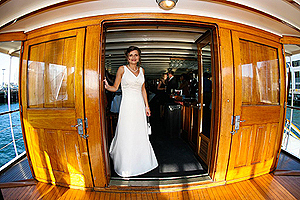 The Hornblower yacht High Spirits is 112′ with five salons, a dance floor, solid teak bar, rare mahogany dining room table and chairs, full galley and stereo sound system. The unique appointments that many guests love are the fireplace on the main deck and the comfortable furnishings in the living room. 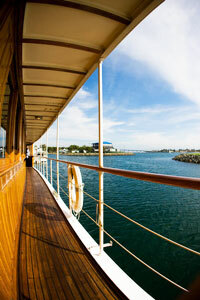 The yacht has three luxurious staterooms. 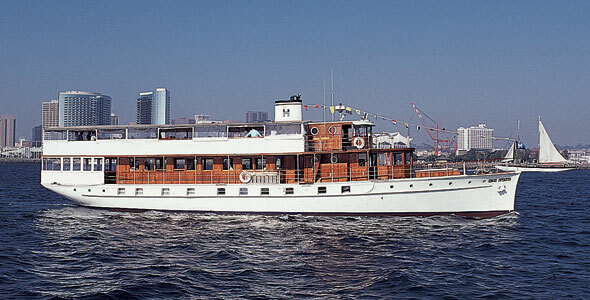 The High Spirits has always been a privately owned yacht and is the sister ship to the Presidential yacht “Sequoia”. She was used during the Roosevelt and Kennedy years along with the Sequoia. During W.W.II, the US Navy purchased her, as they did many private yachts for the use of a patrol ship in the Pacific. In 1985 she was beautifully restored and certified by the US Coast Guard for charters. Her elegant decor features mahogany paneling, a Chippendale design dining table and classic crystal lighting fixtures. Her main salon includes a dance floor, antique piano, a full bar and stereo system. The upper deck offers a bar and dining room with breathtaking views. The High Spirit’s decks and other exterior brightwork of of solid teak. The interior salon panels are constructed of bleached black walnut, rarely found on yachts. The unique windows on this yacht are like automobiles; they can be lowered by a cranking system concealed just below each panel by a sterling silver clam shell. 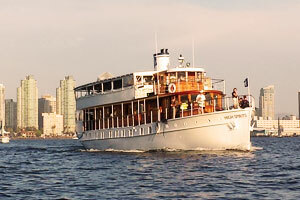 The Hornblower’s High Spirits is the largest Trumpy yacht in operation today. 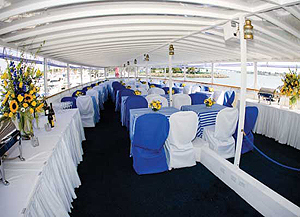 The yacht has a large bow area and walkways that tour the perimeter of the entire main deck. 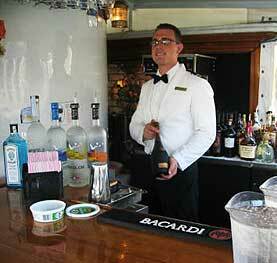 The elegant main salon has antique furnishings, dance floor, and a solid teak bar. The upper dining deck provides a spectacular view of the San Diego Bay. 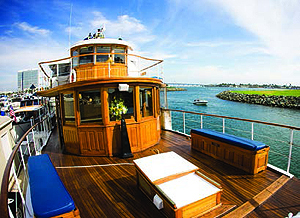 Whatever your occasion to charter a private yacht from San Diego Bay Cruises, the High Spirits motor yacht is ready to accommodate your event and your party. High Spirits comes equipped with all the comforts of a beautiful home in a floating package of luxury. 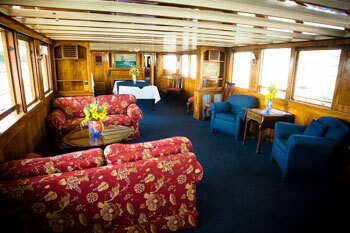 Plenty of comfortable deck and interior seating throughout the vessel. There’s not a bad seat in the house! On board head (bathroom) with fresh water sink. Stereo system to play your favorite cruising or party music.